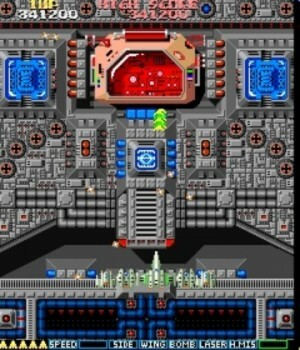 The player, flying a ship over a vertically scrolling background, shoots the enemies using a variety of weapons. These weapons, as well as higher speed, shield and power up are obtained by collecting and trading in stars. At the very beginning of the game, try staying alive as long as possible without shooting any enemies. Youll eventually get hit, but your next ship will have maximum fire power. The longer you can survive without being shot, the larger your bonus will be and the farther along youll restart.PAt certain points in the game, voluntarily changing to the basic weapon shot will sometimes cause a systemcontrolled assistant spaceship to appear and give you a helping hand. The exact circumstances that cause this vehicle to appear are not clear. I believe the automatic player is known as Bob or sometimes Bod. Bob attacks all enemy targets, but is susceptible to their fire. His kills count toward your score. It is possible to preserve Bobs lifespan by using your spaceship to block him from going into danger.PThe small sprouts that can be seen at some points in the game can be made to grow into a tree and bear fruit by shooting at them with the laser weapon.